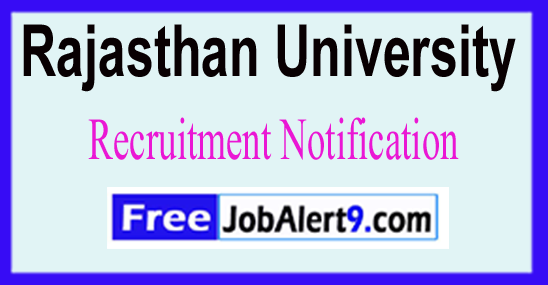 Rajasthan University Has Released Recruitment Notification For 217 Professor, Assistant Professor, Librarian Posts. All Eligible And Interested Candidates Can Apply Online.Further Detailed Information Regarding Educational Qualifications, Age Limit, Selection Procedure, Exam Pattern, Syllabus for Rajasthan University Recruitment 2017 - 217 Professor, Assistant Professor, Librarian Post is mentioned below. Rs. 37,400 - 67,000/- With 10,000/9000/- Grade Pay (Post 1-4), Rs. 15,600 - 39,100/- With 6000/- Grade Pay (Post 5-7) . All Eligible and Interested candidate fill the online application through official website (http://www.uniraj.ac.in). After successfully submitting the application, candidate must send by hard copies of application along with relevant testimonials to the following Address before or on (23rd June 2017). Room No.205, Sardar Patel Bhawan, University of Rajasthan, Jaipur . Dead Line To Submit Online Application Is- 23-06-2017. Closing Date of Offline Submission of Applications Is - 30-06-2017. Click Here For Rajasthan University Recruitment 2017 Detailed Advertisement 1. Click Here For Rajasthan University Recruitment 2017 Detailed Advertisement 2. Click Here For Rajasthan University Recruitment 2017 Detailed Advertisement 3. 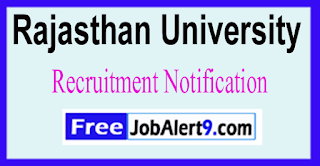 Rajasthan University Has Released Recruitment Notification For 169 Clerk, Lab Assistant Posts. All Eligible & Interested Candidates Can Apply Online.Further Detailed Information Regarding Educational Qualifications, Age Limit, Selection Procedure, Exam Pattern, Syllabus for Rajasthan University Recruitment 2017 - 169 Clerk, Lab Assistant Post is mentioned below. Candidates upper age limit should not Exceed 35 -Years As on (01-07-2017). Rs. 5200 - 20,200/- With 2400/2800/2000/- Grade Pay (Post 1-4,6,7), Rs. 9300 - 34,800/- With 3600/- Grade Pay (Post 5) . All Eligible & Interested candidate fill the online application through official website (http://www.uniraj.ac.in). before / (23rd June 2017). Starting Date of Online Application Form Filling Is - 24-05-2017. Closing Date of Online Submission of Applications Form Is - 23-06-2017. Click Here For Rajasthan University Recruitment 2017 Detailed Advertisement.